Easy to Use: Those that begin serging for the first time may be a bit put off by the complex workings of a serger machine. Many models require the user to take a learning period to understand the serger in and out. With the Brother 1034D its simplicity and instructional video allow this learning period to be shortened or removed completely. Color Coding: The color-coded threading system makes using the machine easier for beginners. Three or Four Threads: One of the most important features in a serger is the number of threads it can provide. The Brother 1034D offers three or four threads to create stitches of professional quality. Affordability: Even with its multitude of features and functions, the Brother 1034D model comes in at an appropriate price. Hem Ability: Rolled hems can only be used on some fabrics thus it may not be useful for sewing thicker or heavier materials. Instructional Video: Users report that the instructional video is made in low resolution. Controls on on Left Side: Right handed users may have trouble adjusting to the controls being on the left side. See the Brother 1034DX for controls on the right side or a comparison of the Brother 1034D Vs 1034DX. 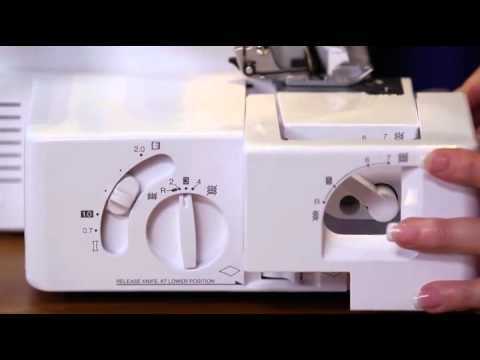 The Brother 1034D Serger fits the needs of every level of serger users. It boasts an array of features for making tasks simpler and quicker. It offers a 3-4 thread system with over 20 stitch options for all serging needs. The Brother serger 1034D features a 3-4 thread system with a lower looper threader. Available stitch options include 4 thread overlock, 3 thread overlock, rolled hem, narrow hem and ribbon lock stitches. By purchasing optional presser feet blind hem pin tuck and flat lock stitches can be sewn as well. Stitch width can be adjusted from the left needle from 5 to 7 millimeters, allowing for the perfect stitch. The Brother 1034D is easy to learn and can use 3 or 4 threads with 22 total stitch options. The differential fabric feed provides for better stitch quality on nearly all materials. It especially comes in handy for thin, stretchy or knitted fabric. The Brother 1034D has a differential feed ratio of 0.7 to 2.0. The 1034D operates at a speed of 1,300 stitches per minute, making it one of the faster sergers. This speed enables the user to finish complex tasks much sooner. Even still, the quality is not compromised in expediting the process thanks to the differential fabric feed. This feature provides management of how tight or loose thread is in each individual stitch. The 1034D model allows for adjustment of the tension for every needle, providing more control over the tightness of any stitch. It helps to identify problem or straying stitches. Being able to move the knife blade keeps it out of the way for sewing without cutting the fabric or having the blade interfere with the work. The brightly lit LED screen makes it much easier to see the work space when sewing at night or in darker areas. The user may remove parts of the arm in order to sew cylindrical items such as collars and sleeves. The Brother 1034D provides built-in storage space to keep clutter out of the way leaving a clean and organized serging space. Click Here to See Brother 1034D Serger Pricing, Pictures and Reviews on Amazon! The Brother 1034D has features that are advanced enough for a professional yet it is still simple enough for a beginner. It has some drawbacks but they are not enough to take away from the fact that this model is a great purchase for the average user.